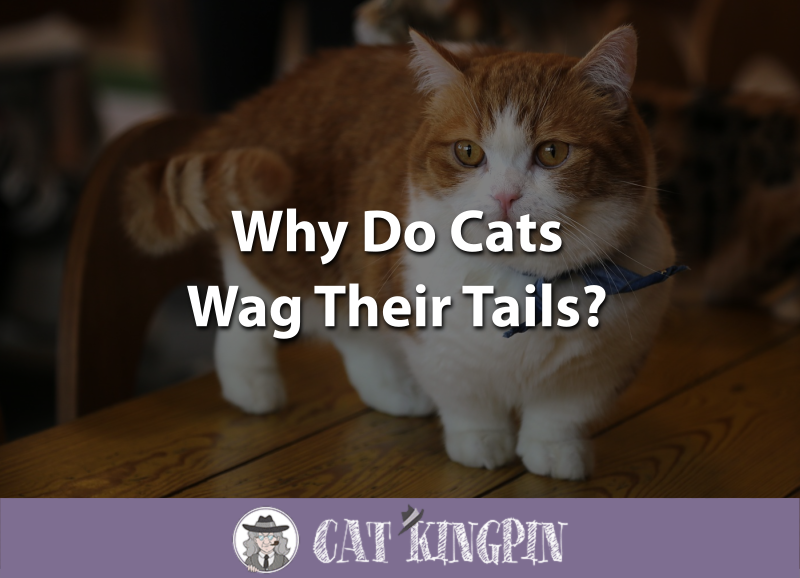 » Why Do Cats Wag Their Tails? Sometimes kittens do things, and we wonder why? Have you ever thought this? From birth to 12 months, cats have different stages. From the moment they open their eyes to the moment they wag their tails, maybe you’ve wondered about some of these really sweet features. When your kitten wags its tail, do you ever get the distinct impression your cat is trying to tell you something? If you are like many cat owners, myself included, you probably spend a fair amount of time talking to your cat. But, do you ever wish your cat could talk back to you? When Do Cats Wag Their Tails? Why Do Cats Twitch Their Tails? Why Do Kittens Wag Their Tails? 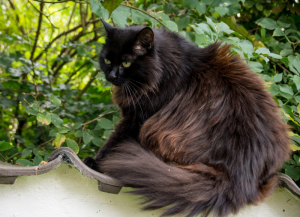 Why Do Cats Vibrate Their Tails? What Do Cat’s Tails Mean? Even though cats don’t speak English, they actually do have their own language; and, it’s one we can learn. “Cat speak” is a combination of the cat’s body language, ear movement, the sounds it makes, and, perhaps most importantly, the way the cat wags its tail. 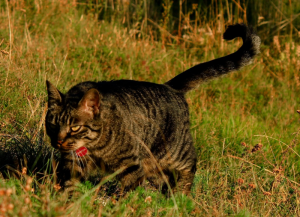 In some respects the reason why cats have tails is a lot like why we have tongues. If you take the time to learn their language, and why they wag their tails, you might find what your cat is saying to you is pretty interesting. Cats wag their tails when they are experiencing certain emotional states. The manner in which they wag their tail can tell you if they are happy, nervous, mad, or in one of many other moods. It is important to remember that the cat’s tail is just one part of its speech. If you take a little time to really watch your cat, you’ll start to see the whole picture of what they are really trying to tell you. Also known as flashing their tails, there are two types of twitching that a cat may do with its tail. The first kind just lets you know the cat is getting annoyed or is afraid. Usually just the tip of the tail will be twitching at this point. If a cat is not playing, this is a serious warning to back off. 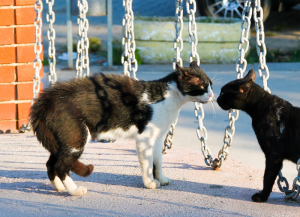 However, it can also be seen sometimes when cats are play fighting, although during this time a cat is more likely to only display wagging if they are still having fun. Since a lot of cat language is instinctual, a kitten will wag their tail in much the same way, and for the same reasons, as an adult cat. Like a human child, though, it does take some time for a kitten to fully develop their language. Additionally, kittens that are raised with other adult cats tend to be more fluent with their communication skills. To put it another way, a kitten that doesn’t have much exposure to other cats may not exhibit the same depth of cat language as a cat that was well-socialized as it grew up. A cat will vibrate their tail or swish it from side to side when they have targeted something they are thinking of attacking. As the cat gets closer to pouncing on the object, the frequency of the vibration or swishing will often increase. If you see you cat focusing in on your foot with its tail swishing back and forth, moving faster and faster, you know you’re about to get pounced on. When your cat holds their tail high and straight up in the air, they are expressing confidence and contentment. You may see this as they stroll about their palace (also known as your house) like a king or queen surveying their domain. A tail sticking straight up signals they are happy and satisfied, and this is usually a time that they are very receptive to affection. If you see them flicking the very tip of their tail as it is being held straight up, they are probably having a particularly happy moment. Much like when it is held up straight, the curved tail means your cat is in a good mood. It’s probably a great time to break out the cats toys and have a play session with your kitty. 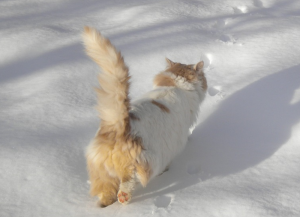 Usually, when a cat has its tail held low, they are not happy about something. 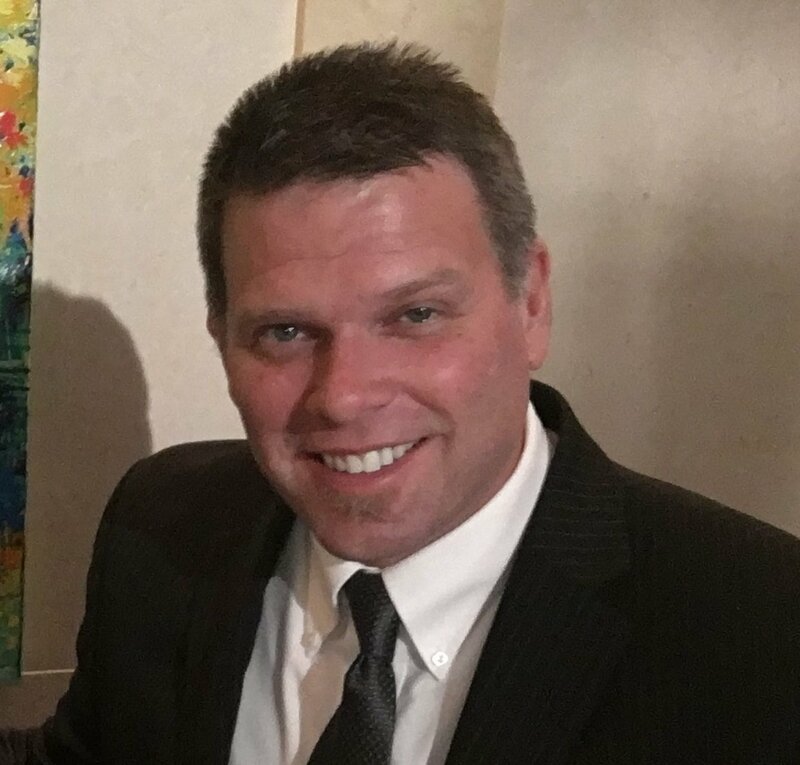 Often, it is a sign they are feeling aggressive or are on the defense. They will also have other signs, like this cat, who is crouched down and has its ears lower on its head. This is a good time to give the cat some distance as they are feeling very serious or unsure about the situation. Keep in mind that some breeds, such as exotic shorthairs and Persians, often hold their tails lower than other breeds regardless of their mood. When a cat curls its tail beneath its body, it is afraid, or may be signaling submission. You should give your cat some space and let them get more comfortable. As you can see in this example, this tuxedo cat is very nervous about meeting this black cat, so his tail is tucked underneath him. A cat that is scared or startled will puff up and wag its tail. This is a response to make the cat seem bigger and, hopefully, make whatever is threatening the cat think twice about messing with it. It’s usually accompanied by the hair along the cat’s back standing up on end as well. However, as the following video shows, a cat that very comfortable with its person will often “say” how big and bad it is even though the cat is really just playing. 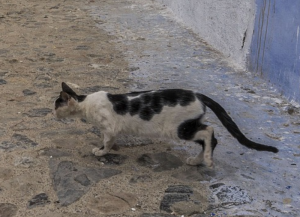 You can tell this cat is playing because its ears are mostly forward and there’s no hissing, growling, or other signs of aggression being displayed. If your cat comes up and wraps its tail around your arm or leg, it’s a sign of affection and friendship. Much like a human hug, it says, “We belong together!” Cats will also wrap their tail around things that they like, just like this cat here has its tail wrapped comfortably around the bar. So, Why Do Cats Wag Their Tails? Cats are expressive creatures, and their tails are one of their principle forms of communication. Like with any language, learning “cat speak” takes time and practice. There are a number of resources that can be very helpful in deciphering what your cat might be saying. How to Speak Cat: A Guide to Decoding Cat Language is a great book that includes over 30 poses so you can see exactly what each tail position means. The Secret Language of Cats delves not just into cat tails, but explores all of the cat’s body language. Finally, there’s Catspeak: How to Communicate with Cats by Learning Their Secret Language which was written by the renowned animal behaviorist, Bash Dibra, and focuses on how you can communicate with your cat by learning their language. Communication is the foundation of any good relationship. By taking some time to learn what your cat is saying to you when it wags its tail, you can enhance your relationship with your cat and make a good friendship even stronger. If you have any questions or would like to share a story about your cat and how they express themselves by wagging their tail, please tell us in the comments below! We’d love to hear from you!